Description of decorations: Branch, sand, leaf. 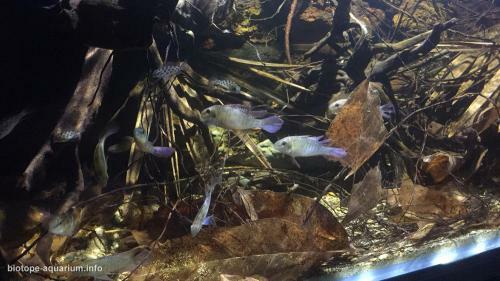 Description of equipment: Filter: Eheim 2260, FLUVAL 110. Light: kessile 50wx2. Water parameters: pH value is about 4. Description of the area surrounding the biotope: After the rainy season, local rivers formed small ponds with clear water. Shrubs, roots and vegetation are soaked in the water, which became the captives of the rain. 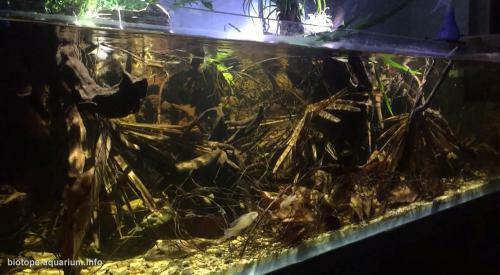 The residue and waste of plants became the natural food of the fish; the roots of branches in the water and thick fallen leaves turned into the best shelter for avoiding predators. As time goes by, the branches and leaves beneath the soft sandy water became the most comfortable soft bed for fish to live and breed. Other branches that cannot be completely digested by the water makes the water looks like tea. Description of the underwater landscape of the biotope: After the rainy season, local rivers formed small ponds with clear water. Shrubs, roots and vegetation are soaked in the water, which became the captives of the rain. 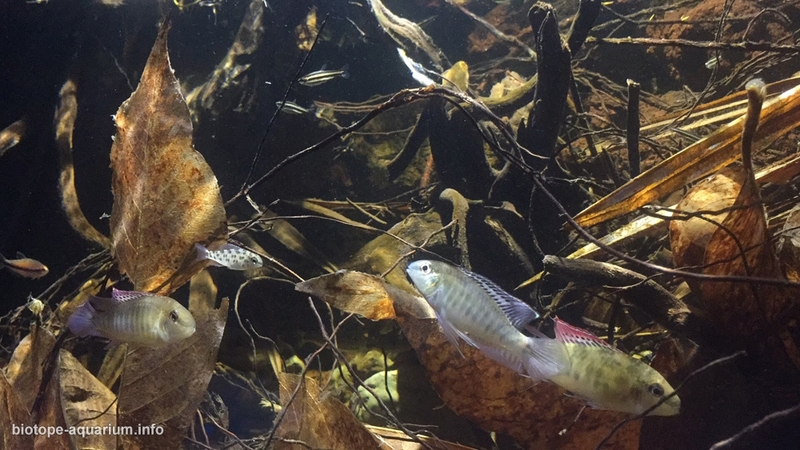 The residue and waste of plants became the natural food of the fish; the roots of branches in the water and thick fallen leaves turned into the best shelter for avoiding predators. As time goes by, the branches and leaves beneath the soft sandy water became the most comfortable soft bed for fish to live and breed. Other branches that cannot be completely digested by the water makes the water looks like tea. 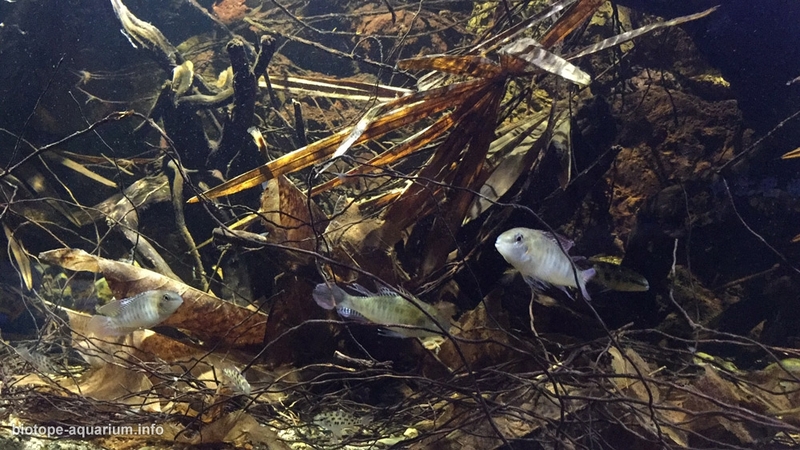 Description of the parameters of the habitat: During the rainy season (from 6th September to 29th May, lasts for around 7 or 8 months), the water temperature is relatively low at around 23℃; the pH value of the water is about 6. During the dry season (from 29th May to 6th September, lasts for around 2 or 3 months), the water level is low and the temperature rises, the water temperature is around 28-30℃. With low water level and an amount of branches, the pH value is about 3.5-4. 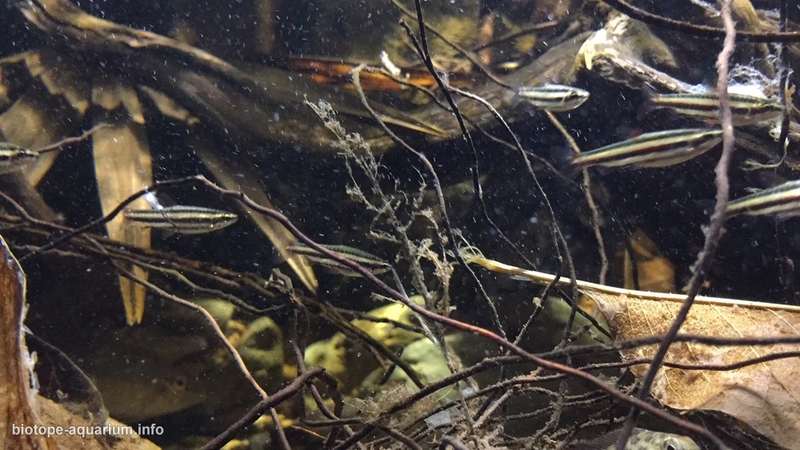 List of fishes and invertebrates occurring in the nature biotope: Crenuchus spilurus, Nanostomus eques, Dicrossus filamentosus, Nannostomus marginatus, Taeniacara candidi. Threats to the ecology: Every type of fish has its own spiritual homeland. They get along with the world perfectly only at places they are familiar with, just like human beings. They are exhausted after a long way across the sea. What we can do is to provide a place for them to feel like home in an unfamiliar land. Based on this, I started to look up their birthplace and I was gradually attracted by the mystical habitat of the Amazon basin. Consequently, an ecological tank that is close to the initial birthplace habitat was born. I hope this tank will allow the guests to feel at home at a distant place.